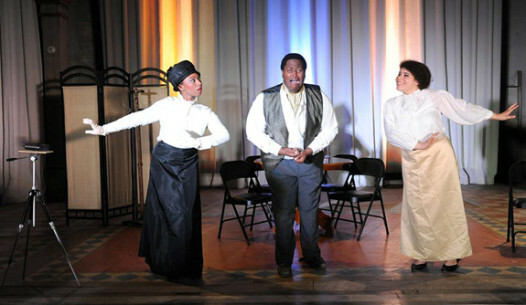 Kate Chopin’s ‘An Embarrassing Position’ performed by the 9th Ward Opera Company at the Marigny Opera House. From left: Toni Skidmore, Dedrian Hogan, and Amanda McCarthy. Newcomers often arrive in New Orleans green and keen to insert themselves into one of two camps: those who bend to the city’s history and culture, and those who expect it to bend to them. Rather than focusing on the latter, who are all too fond of whacking us with branches of naïve arrogance, I prefer to expend my time and hopefully yours on the former group, at least a couple who typify the most admirable version of it. But first, the safe way for a new resident to proceed is by keeping one’s head down for a self-imposed period of time (a solid year allows our unique cyclical time to sink in), learning by (mis)pronouncing, eating, drinking, living, and reading to begin the process of understanding life in this little Afro-Euro-Caribbean outpost. It’s then welcome and delightful when an unfamiliar head pops up, bringing something new to light, wholly NOLA but in rearranged fashion. In other words, the geography of their imagination fits in the notch of the city like tongue and groove joints. Now that the stage has been set, it’s time to introduce the subjects: author Kate Chopin and composer/playwright Dan Shore, now linked, across a span of 120 years, by Chopin’s formerly-forgotten play An Embarrassing Position. Although the next time the public-at-large hears from Shore, it’s likely to be by way of the highly awaited completion of Freedom Ride, we’re going to peer smaller-scale at a different show, one with its basis in the early 1890’s, seemingly the only play Chopin ever completed. Chopin wrote and submitted for competition An Embarrassing Position in her early 40s, when she was widowed and back in St. Louis after her husband Oscar’s financial collapse took them from New Orleans to Cloutierville, where he died. The former Kate O’Flaherty was writing music (first in print with a polka), short stories, essays, and seemingly anything that might be entered for contest or otherwise submitted. As historian Emily Toth puts it, Chopin “was impatient to establish herself” and “figuring out how to write what would sell.” An Embarrassing Position—a hijinks-rich vignette set in New Orleans featuring an aspiring politician—received neither response nor prize, so her playwriting pursuits were left behind. Without The Library of America’s stuffed Kate Chopin: Complete Novels and Stories, her brief foray into theatre would remain a footnote, likely no longer extant. But it was in those overlooked pages that Shore saw promise shortly after arriving here, reading to learn from her regional stories. The merits of the fleshed out An Embarrassing Position, performed by The 9th Ward Opera Company at the Marigny Opera House in late July 2013, are without question. Proper critiques of this showwere written by those with background, but let me stumble along and crow that this half hour of musical theatre was one of the highlights of my performance year. Although it was double-billed with Blue Monday, An Embarrassing Position easily out-Gershwined Gershwin. Those who attended one of the four sold-out nights witnessed a well-directed, tone-deft perfect balance of smart and catchy, historic and timeless, inquisitive and twirling. A dive into the source material pays even more dividends, as it allows that this century-apart collaboration was not so much Shore’s standing on the shoulders of Chopin but a two-headed approach. Thumbs up all around to Dedrian Hogan in the role of Willis Parkham, Amanda McCarthy as Eva Delvigne, Kathleen Westfall’s June Jenkins, and Toni Skidmore as Miss Paige. Exchanges between Parkham and Delvigne dealing with sugar cubes and a telegram (brought to life by Shore from the barest of bones) charmed early on, as did those that followed with the introduction of Jenkins and Paige (new characters by Shore). At a time in which an uncomfortable number of venues and performing arts organizations seem to be testing the placebo effect by letting their aesthetic bars slip, kudos to the Marigny Opera House and The 9th Ward Opera Company for not only taking on Shore’s adaptation but also for an admirable ongoing run of shows bearing strong qualities. It speaks volumes that the top-notch performers of the double-bill were almost entirely music students or graduates from our local universities, including Xavier, where Shore teaches. Try as he may, our unworthy governor hasn’t completely succeeded in marring higher education. This article is reposted from Press Street: Room 220, a content partner of NolaVie.